With funding from the United States Army, researchers at the University of Illinois are looking for ways to repair complicated skull injuries with biomaterials—substances that can interact with or guide the body’s natural healing processes—instead of using artificial materials like titanium plates or grafting bone from other areas onto the head. On the battlefield, soldiers usually wear protective gear that covers most of their bodies, but in many cases the Kevlar helmets that soldiers wear cannot fully protect the face, head, and neck. A 2013 article in the journal Military Medicine reported on the increase in combat-related head, face, and neck injuries among service personnel wearing combat body armor. With funding from the U.S. Army, researchers at the University of Illinois are looking for ways to repair complicated skull injuries with biomaterials—substances that can interact with or guide the body’s natural healing processes—instead of using artificial materials like titanium plates or grafting bone from other areas onto the head. 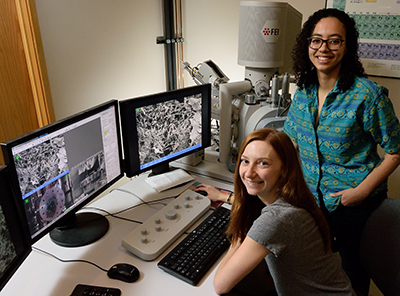 Marley Dewey, left, and Aleczandria Tiffany examine how 3D-printed biomaterials can be used to reinforce the mineralized collagen scaffold with the help of the electron scanning microscope in the Microscopy Suite. “The defects of the skull typically in battle injuries are very strange in shape, so we want to be able to design a scaffold or composite that can fit that exact shape for them and then it would regenerate their own bone,” said Marley Dewey, a doctoral student working in the lab of Brendan Harley, an associate professor of chemical and biomolecular engineering. According to Harley, the project seeks to pioneer approaches to integrate a bioactive collagen biomaterial that includes micro-scale porosity with a strong reinforcement frame generated via 3D-printing with macro-scale porosity. Dewey and her colleague Aleczandria Tiffany, also a Ph.D. candidate, are using mineralized collagen to regenerate bone. The tools in Beckman’s Microscopy Suite help them see if they are getting the desired results. 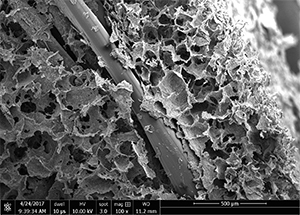 Dewey examines how 3D-printed biomaterials can be used to reinforce the mineralized collagen scaffold, which isn’t as strong as regular bone. The goal is to create a composite composed of biodegradable materials that break down over time after bone cells have started to proliferate. Deciding on the proper amount of scaffolding material can also be tricky. Dewey uses the environmental scanning electron microscope (ESEM) and the micro x-ray computed tomography (microCT) system in Beckman’s Microscopy Suite to examine cellular response on the composites. A polylactic acid 3D print fully incorporated into mineralized collagen to form a composite. Image taken on the electron scanning microscope provided by Marley Dewey. “I am looking for changes in structure and mineralization, but also to see that the 3D-printed materials are fully integrated into the mineralized collagen biomaterial, because gaps between them wouldn’t be ideal,” Dewey said. In addition, she uses the ESEM to examine the integration of anti-inflammatory agents incorporated into the collagen to combat bacterial infections and inflammatory responses that could be detrimental to soldiers experiencing a blast injury to the jaw on a battlefield, where it’s likely to be unhygienic. Tiffany examines how incorporating growth factors—such as vascular endothelial growth factor and minerals such as zinc—work in helping an individual’s own bone grow within the scaffold. Zinc is incorporated into the scaffolds to promote mineralization and induce differentiation of stem cells. Using the ESEM allows Tiffany to see how zinc affects the microstructure within the scaffolds. 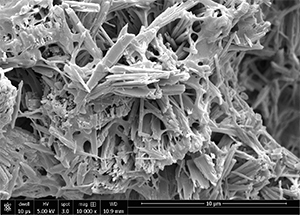 Mineralized collagen scaffolds display an altered microstructure with zinc supplementation. Traditionally, these scaffolds have plate-like crystals but once zinc is added the crystals become elongated. These differences in microstructure may alter how stem cells generating bone interact with the scaffold. A cell’s microenvironment dictates its behavior, and this is something Tiffany hopes to explore more fully. “Ideally I would want to see a cellular response to the zinc,” Tiffany said. “Hopefully with the addition of zinc we would see an increase in differentiation into osteoblasts and the expression of bone-related genes.” She hopes to use critical point drying at Beckman to examine how the cell’s morphology changes in her various scaffold types. Both Dewey and Tiffany appreciate the one-on-one support from the Microscopy Suite staff. Dewey thinks that the Microscopy Suite staff’s assistance has helped her produce great images useful in publications and presentations. Tiffany, likewise, hadn’t had experience with the microscopes and credits Cate Wallace, Leilei Yin, and Robinson with providing their expertise to help the project along.